If you are fond of puzzle games, then you must try 3 Sprockets’ minimalist puzzler. The game’s extremely addicting, easy to play and a perfect stress-buster. You will be given a set of shapes or Tetrominoes. Shapes can be Cubes, L-shapes, T-shapes etc. Brings back fond memories of Tetris, don’t they? 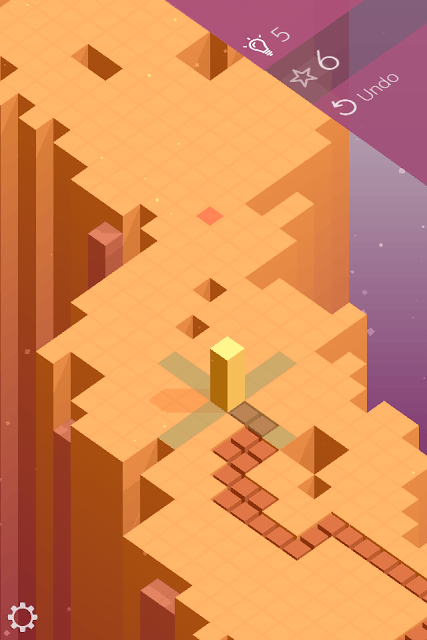 However, Outfolded offers a unique concept and is as much addicting as Alexey Pajitnov’s epic puzzle game. You will have ample time to think and because you can undo anytime, you can experiment use switch between different shapes as the situation demands. Examine the game board, look for narrow paths, the position of the target tile and how far it is from your current position. Try to reach the target tile using fewer shapes. For every piece you save, you will receive a free hint. You can use this hint to solve harder puzzles. You can also receive a free hint by completing daily challenges. Keep in mind that chasms may stop a bigger shape from unfolding completely. Don’t drag an object onto the starting tile if you spot a narrow path ahead. Use slimmer shapes. Once you reach a wider area that does not have any gaps, you can comfortably use a large O, U or any other shape to reach your target tile faster. Choose your first shape wisely, because it can determine the direction you will be going to reach the target tile. If the path is narrow, then better choose compact shapes like columns (I-shapes) and cubes. For a very narrow path, you can choose long I-shapes. The I-shape will keep unfolding until you get out of the narrow bridge and reach the wide area. From there, you can use bigger shapes like O, U, etc. to reach the target faster. If there’s only a tile surrounded by gaps, try to use a cube to get past the tile and then you can use any available shape. Some big shapes can be used to bridge gaps in case there are too many chasms on the game board. Try to move in that direction where the target tile is positioned. So if the tile is placed to the far upper right side, then keep unfolding shapes moving in upper right direction to reach the target faster. 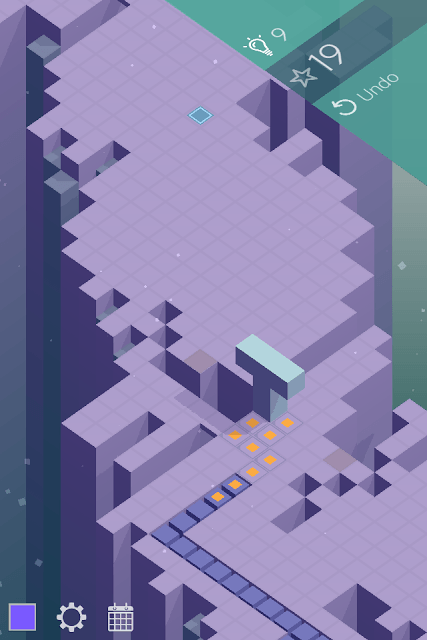 While unfolding shapes, try to swipe up as much as possible to reach the target tile faster. I- and L-shapes should be swiped up to get to the target quickly. You may have to swipe left or right in case there’s a chasm ahead or the shape can’t unfold in that particular area because it won’t fit. There’s no hurry in completing a level, so just sit back and relax. There are no time or move limits, plus you have unlimited undos. If you think you have chosen the wrong shape or have swiped in the wrong direction, tap the undo button at the top of the screen. If your entire unfold strategy is in the wrong direction, then just press and hold the Undo button to clear all shapes.